The key to early recognition of potential change in structure is in observing and identifying "SOMETHING DIFFERENT". I absolutely love this example which has been building now since the beginning of the year. This does not mean that the uptrend will end. It's just a warning sign. 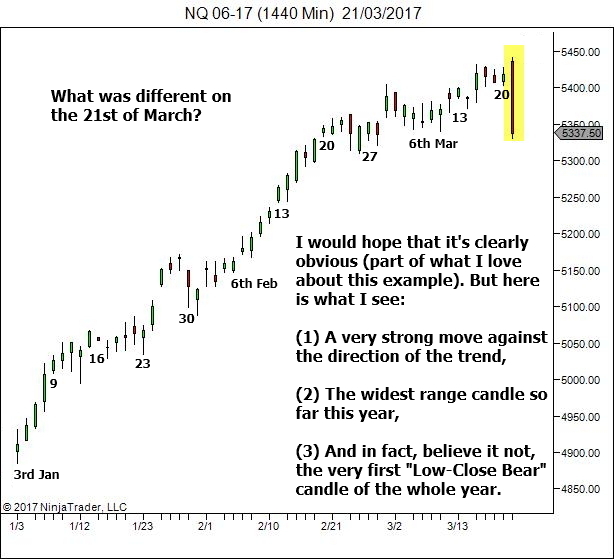 A clue that the sentiment driving the market prior to this date has changed in some way. A clue that there is "potential" for a change in market structure. And for those of you who recognise this clue, the potential to more quickly adapt to any change in structure as it happens, or even before the technical change has occurred. For those of you who wish to join the ranks of professional traders, this is a skill you need to build. Quickly recognising and adapting to changes in the market. And step one in that process is early recognition of "something different". I'm just stunned by that last fact. In a stable trend, watch for changes in volatility, or in the pace of the trend. Watch for changes in the way that price swings project beyond the previous swing high or low. Or in changes to the depth of pullbacks. Or, as in today's example, watch for a sudden and strong move counter-trend. In a stable sideways market, watch again for sudden changes in volatility. Or sudden and dramatic increases in volume. Or (one of my favourites) watch for signs of price compression towards either the upper or lower boundaries of the range. Something different in the way that price has been moving. Question it. What could it mean? 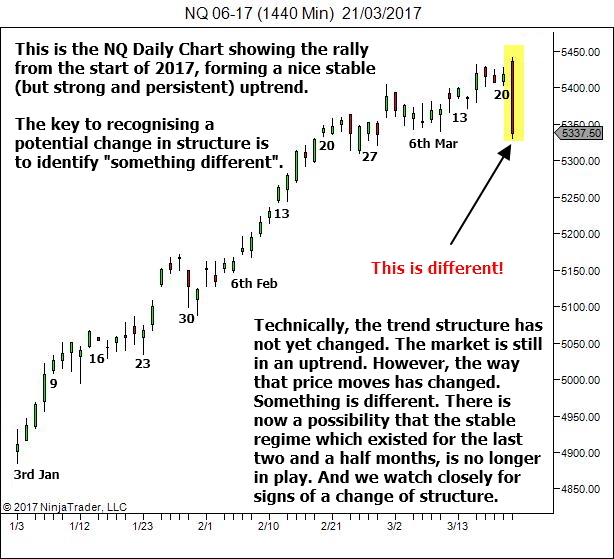 Could this in any way provide a clue to a potential change in structure? In many articles here on YTS talks about the sentiment of traders, their emotions – fear, uncertainty. They make predictable decisions under the influence of emotions. Strength and weakness are also the result of emotions and decisions taken under their influence. However, we know that the percentage of trade in automatic systems (robots) is constantly increasing. Already, it is very significant and will grow in the future. The program does not have emotions, fear, etc. These algorithms are self-learning and self-adjusting. Will the concept, considered at YTC work now and in the near future? I’m going to cheat here and copy/paste a prior email reply which answers a similar (but not exactly the same) question. Hopefully it is sufficient. If it hasn’t quite addressed your concerns, please get back to me. Markets are not, and have never been, static. The participants change. Volatility changes. The regulatory framework changes. And all changes will influence to some degree the way in which price moves within that market. The increase in the number of algos is just one of the recent changes. It’s our job as traders to adapt to the changing environment. You say algo participation is at 80%. Here’s another stat though… all price movement is 100% a result of orderfow. Now this orderflow is comprised of different groups, some the retail trader operating from home, some the professional trader operating from home, some the institutional “human” traders, some the algos etc. Who comprises the orderflow at any one particular time though, is laregly irrelevant. All market movement is orderflow. And that orderflow is created by the decisions and actions of all participants, which includes the algo (in accordance with it’s programming). Look at your charts. The algos are already in there. 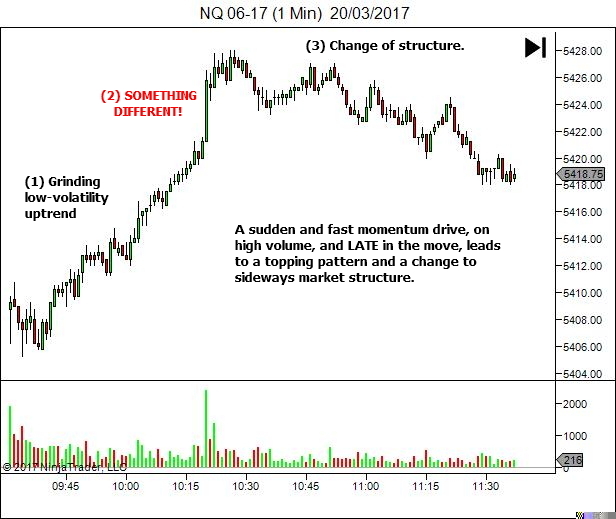 The current chart patterns are the net result of all orderflow, including algo orderflow. So the game is this… given the way price currently moves within your market, find the areas of opportunity. The game is no different to what it has always been. It’s just the players who have changed. We can loosely divide our 100% participation into two general categories… those who are consistently successful… and those who are consistently failing. There is some grey area in-between, but generally we are fine to make this loose classification. Who are the people entering long right into an area of resistance? It can’t be the professionals. By definition, we say that the professionals are the people who are consistently profitable (whether big in size or small or human or programs). And it’s not the actions of a consistently profitable trader to be consistently taking low odds trades such as entering long into an area of resistance. Therefore it must be the amateurs (or novices). Who are the people entering short right into an area of support? Once again it can’t be the professionals, as this is not a consistently profitable strategy. It must therefore be the amateurs (or novices). 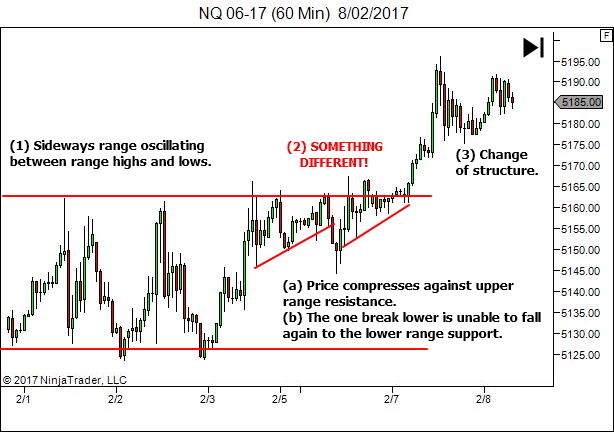 Likewise with traps… a professional trader is not consistently entering breakouts of range highs/lows in a weak consolidating market. Yes, through errors in analysis, or any one of dozens of other reasons, part of this orderflow this time may comprise some professionals. But typically this is not a place they trade. So therefore most of the orderflow here will be comprised of amateurs. Same for any other trap. Who is rushing to enter a reversal against a strong uptrend, when price broke the recent retracement swing low (think 3-swing retracement). It’s not the actions of a consistently profitable professional. So it must be the amateurs. So… if the professionals are those who are consistently profitable. And the amateurs are those who are consistent losers. We are simply identifying the places were the consistent loser is getting trapped in a losing trade. By trading against them, we are trading with the professionals. Find the areas where someone is trapped against the market bias, trade against them, and you have an edge. If algos are in the market, and if we assume that they’re more often than not a part of the ‘professional, consistently profitable’ orderflow, and if we’re correctly aligned with market flow, then more often than not we’ll be trading with them. So, their presence helps us! It’s all just orderflow. Who comprises that orderflow is largely irrelevant. And in fact unknowable, so it’s largely pointless trying to speculate. What matters is simply identifying places where someone is trapped against the bias of future price action, and in assessing where they’re likely to be at maximum pain and where they’re likely to exit their position. (This maximum pain / emotion concept applies to algos as well… it will be evident in their programming simply as the point at which they take a loss). I find it helps to loosely categorise the trapped traders as the novices, with the trapper being the professionals, due to the fact that any consistently profitable trader does not consistently get trapped. However it’s a generalisation… as even the pro’s mis-read the bias and get trapped from time to time. “Who” is not important (whether it’s an HFT, an institution, or a retail trader making their very first trade)… the fact that someone is trapped is important. So… algos… bring them on. I welcome them. The recent hysteria regarding their introduction is just the market loser trying to find a new excuse for their continued failure. Let me know if this hasn’t adequately answered your question. 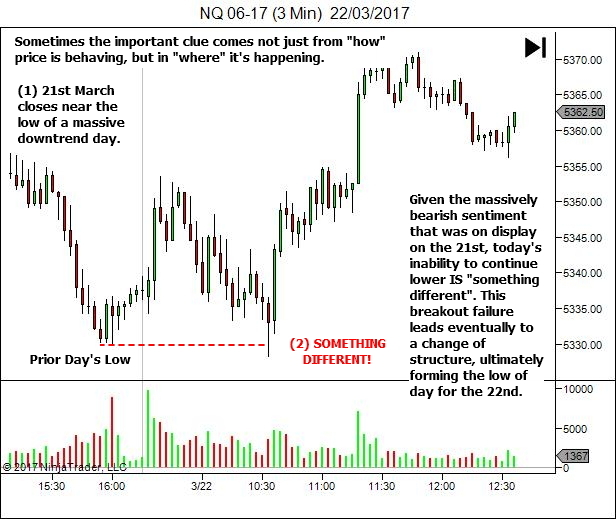 Quick summary… all market participants do have emotional breaking points. With the algos it’s simply encoded within their programming. However, if we consider the algos as part of the group that has a consistent edge in the market, then more often than not we’ll be trading with them, not against them. Thanks for the detailed answer, Lance. Everything is clear and logical. Only one circumstance confuses me. We have to trade “with” algos, because they are “professionals”. Good. But is it possible to say that their behavior is identical to the human when trading? A human does not always follow his own trading plan, can make mistakes, get sick and so on. Algos – never. Do we need other, new approaches to assess the actions of the new main player in the market? I’ve not needed to change anything yet. Once again, I thank You for the answers, Lance. You increased my confidence in the strategy and myself.